Just as all students of Swami have pleasant memories of their student days and the formative years they spent in His divine presence, most of them also have something sweet and interesting to share about their relationship with the Lord Ganesha. 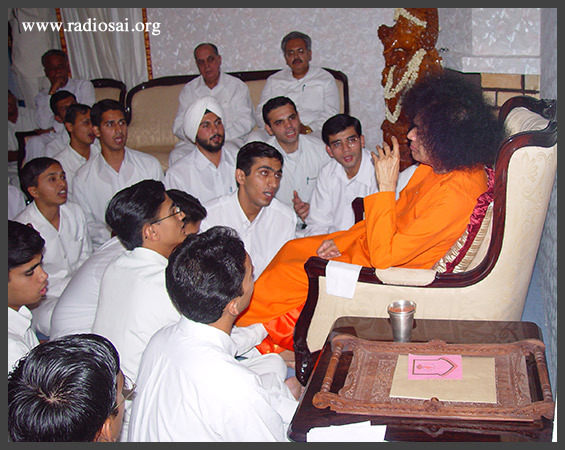 A bonding with this most endearing form of the Lord seems to be a spontaneous happening in the life of most students, especially Swami's students. May be it is due to the many hours that they spend trying to implore Him to help them in their exams! Or because it has become a habit to pray to Him before they start anything new – a habit that was inculcated by Swami Himself. But there are a few instances when Swami 'concretises' this special bond with a memorable gift. 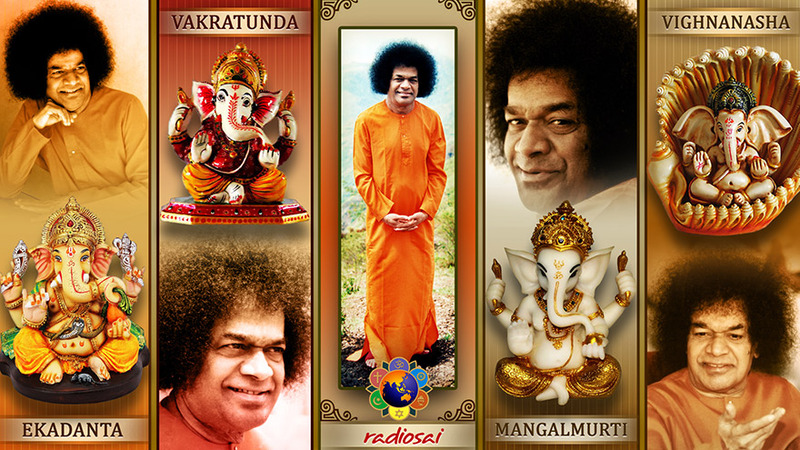 And even as we celebrate the holy festival of Lord Ganesha we bring you accounts of two such divine manifestations from amongst the Radio Sai Team itself. Ganesh joined Bhagawan's University for his B. Sc. in 1999 at the Prasanthi Nilayam campus. 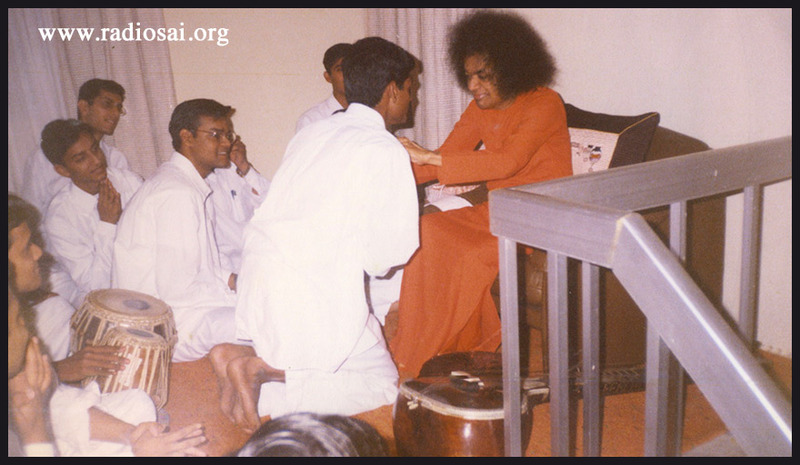 After completing his graduation, majoring in physics he went on to do three more courses, all with the desire to remain in Bhagawan's fold for as long as he could. He did his M.Sc. Physics, a one year diploma in Indian Culture, and then an MBA. 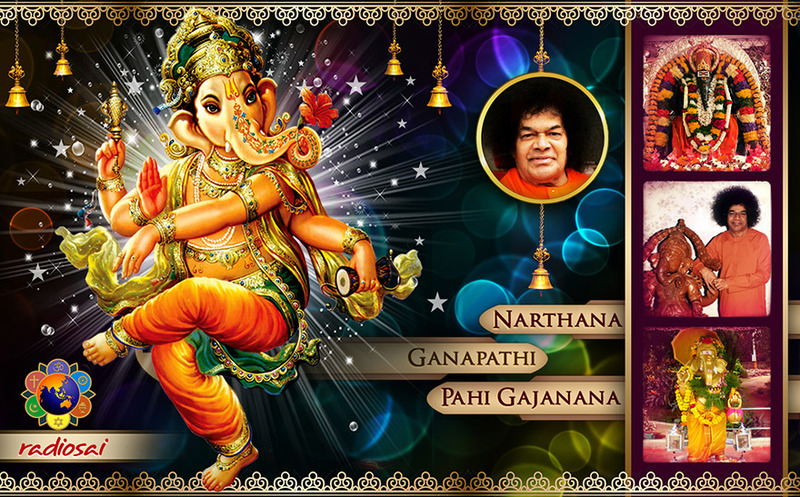 Ganesh is known for his talent in dance and for being instrumental in forming the Prasanthi Dance Group which has had the opportunity to perform several times in the Divine physical presence. He has been a member of the Radio Sai Team since 2011. Ganesh Chathurthi is a very grand festival in the students' circle, because He is much loved by the students and also there is a very sweet relationship between Swami, Ganesha and the students. And we all have seen how the culmination of the Ganesh Chathurthi festival here is marked in a beautiful and colourful way. The boys get a chance to display their creativity when they make beautiful chariots and palanquins for their Ganeshas and bring all the idols in a procession from the Hostel to our Sai Shiva. But here is one beautiful incident where the Creator Himself had created a masterpiece and I was so lost in the beauty of the creation that I forgot the Creator for a moment. It was during the 2004 Ganesh Chathurthi, September 18 to be precise and we students had the opportunity to offer a programme about the significance of celebrating this festival. As part of that presentation, Swami had given me the opportunity to dance, and I performed for the Ganesha Pancharatna stotram. The boy pointing to me said, ‘Swami, the boy sitting there’. So saying he asked me to come forward and he went back to his place. Swami then asked me, ‘For which song did you dance?’ I said, ‘Swami for Ganesha Pancharatna’. Then Swami asked, ‘Who sang the song?’ The song we played on that day was rendered by M. S. Subbulakshmi amma. When I told Him that, He was all the more happy because of the soft corner He has for her devotion and her soul stirring songs. He then asked me, ‘Do you worship Ganesha?’ ‘Yes Swami’, I replied. Then He instructed me to sit and all through the bhajans and prasadam distribution, I was seated there. I was sitting right next to Swami for a good five to ten minutes. Then Swami turned to me and asked, ‘Do you like Ganesha?’ I said yes and He then waved His hand and created a beautiful golden Ganesha for me. I was so wonder struck with the beauty of this creation; it was so very elegant as Swami's creations always are. It is about three to four centimetres tall and the design of the Ganesha is exactly the same as the one which used to be in the portico behind Swami in the Sai Kulwant Hall; the yagnopaveetam (sacred thread), the mooshika (mouse), the modaka in the hand, it’s all so clearly etched there and it’s a marvel. Swami gave me an answer which surprised me. He said, ‘You need not do any pooja, just show it to everyone and give them happiness’. This was one beautiful experience I had and it is etched very clearly in my heart. Even today I show this Ganesha to whomever I come across and they all feel so happy seeing this creation. Sai Prakash is one of the senior most members of the Radio Sai Team. He also happens to be amongst those who were fortunate enough to complete their entire education, from Primary to Post-Graduate, in Bhagawan's institutions. He completed his B.Sc. (Bio sciences) from the Brindavan Campus in 1999 and his M. Sc. (Biosciences) in 2001. Shortly thereafter he joined the Prasanthi Digital Studio, the home of Radio Sai. Sai Prakash is a talented sitar and harmonium player, and a skilful artist with a flair for painting. This incident I wish to narrate happened on May 6, Easwaramma day of 1999 and we were fortunate enough to be with Swami in Kodaikanal on that day. Actually the story started on the previous evening. We were having a session with Swami, all ladies sitting on one side and the boys sitting around Swami in Sai Sruthi at Kodaikanal. Suddenly we saw water flowing down the steps from the first floor. There was bit of panic and Swami calmed us down by saying, ‘Don’t worry, don’t worry it’ll all be cleared’. Immediately they had to bring a lot of room heaters to dry up the whole place. What had actually happened was there was heavy rain and some leaves had got stuck in one of the rainwater drain-pipes and blocked it, and that’s how the water came down into the building. So there was a little bit of uneasiness and Swami was concerned about where the boys would sleep, because we usually slept right outside Swami’s room on the floor in Kodai. That whole area had got wet and so Swami was enquiring as to whether the carpet would be dried up before boys go to sleep. Swami then retired to His room for the day, but came out again at night just to see whether all the boys were having enough place to sleep. He in fact even came down and said, ‘Let the boys go into the interview room and sleep there’. So that whole episode had caused a bit of unrest that entire evening. I was thinking, why not make a small musical offering the next morning even as Swami comes out of His room, it being Easwaramma day. I felt that might help in forgetting this whole unpleasant episode of this water coming down the steps and all that. Anyways we thought it will be a good offering to make. 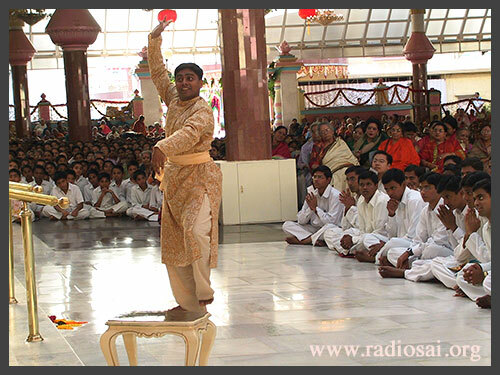 Some of the elders instructed us not to push for the programme too hard, they said if Swami permits then perform. Remember it was Easwaramma day, a busy day at Kodaikanal. (Bhagawan would organise an elaborate Narayana Seva in Kodaikanal during Easwaramma Day every year.) So we were ready, myself and my brother, me with the sitar and he with the tabla. 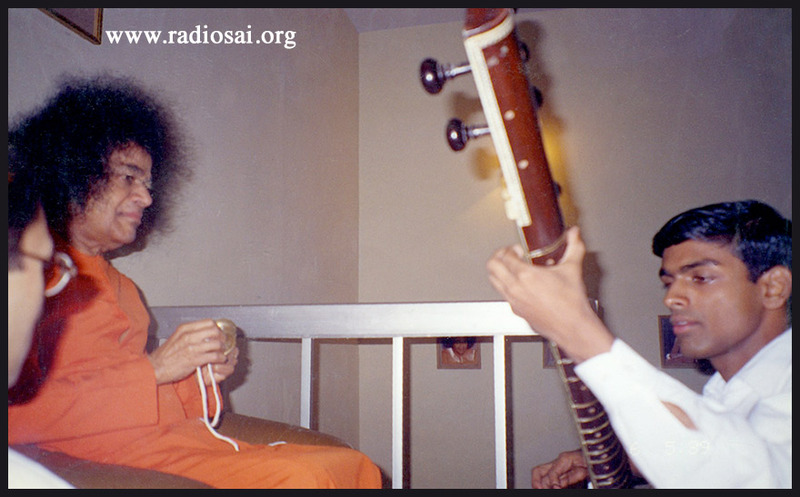 And as Swami came out from His room He saw us sitting with the instruments and He was so happy. Spontaneously Swami said, “You have brought a sitar? Ha play, play!” I had decided to play the bhajan, 'Easwaramba Priya Tanaya' first because that is in raga Ahir Bhairav which is a morning raga and also it would be a nice offering on Easwaramma day. So I started playing that and meanwhile somebody gave Swami a talam (cymbals) and Swami was playing the talam as I was playing the sitar. It was going on nicely when suddenly Swami looked at me and said, “Hey play raag Hamsadhvani.” There was one light instrumental piece that I had heard in raag Hamsadhvani and so I started playing that. Swami stopped me and said, “No, not that, play Vathapi Ganapathim (a popular Ganesha song in that raga)”. Sitar is a Hindustani instrument and this is a Carnatic song and also I was not too familiar with it either. So I said, “Swami, I have not learnt this song”. Then Swami did something very sweet, He said, "It is simple" and started singing the song line by line and I started following Him. So as He would sing a line and I would just follow Him on the sitar. He was also giving the beat with the talam as He was singing. Swami sang the entire first paragraph, and in the end said, “See since you played Ganesha’s song I will give you this Ganesha”. Saying thus, He waved His hand and materialized this beautiful chain (which I am wearing now). This chain has this pendant of Lord Ganesha and there is a small bead. Till date I have never understood why that bead is there, but something interesting happened many years later, must be 2005 or 2006. One morning when I woke up I noticed that the bead had come out; it had got detached from the pendent. I gave this to my parents and told them to keep it somewhere safe. I thought we could probably get it repaired by a goldsmith later. But when we looked for the bead after some days, we could not find it where we had kept it. We looked for it all over the place, in the cupboard, under the clothes and everywhere but could not find it. And I clearly remember my father putting it in a piece of paper, folding it and keeping it in a purse. But it was just not to be found. So I just prayed to Swami and forgot about it. For nearly four to five years I was wearing this chain without the bead and I had concluded that may be the purpose of that bead had been served and that is why it had vanished. But suddenly one day my mother calls me and says, “Come home quickly, I have something to tell you”. When I went home, she said that that morning she had this strong urge to do kumkum abhishekham. And we have in a box this Kumkum which is given as Dasara prasadam after the archana in mandir. When she took the kumkum out of that box, this bead was found inside. Imagine, after a gap of 4 years and there’s no way somebody would have gone and put it in that. When I tried to correlate the events in those four years, with the disappearance and reappearance of the bead, I realised I had got so busy with work in the studio that my sitar practice had really come down. And it was in 2008, when more boys joined the studio, I began to find more time to practice, and Swami gave back that bead. I may be absolutely wrong, but that’s the correlation I found. So that's the wonderful story of how Swami blessed me with this Ganesha chain. May be I should add one more thing that happened. After I came back from Kodai, once I had this opportunity to share with Mandolin U Srinivas this whole episode; how Swami had asked me to play Vathapi Ganapathim and as it was a Carnatic krithi I did not know it and that Swami wanted me to learn it. When he went back, he recorded on a cassette Vathapi Ganapathim in a very slow tempo and sent it to me. He had also recorded in that cassette, two to three other krithis in a very slow tempo, possibly the slowest he has ever played on his mandolin. So I picked up those krithis from that cassette. Just that thought crossed my mind and Swami called Brother Srinivasulu (a student who now serves in the Books and Publications Division) and said, “After the tiffin session, our boys should sing.” We were not scheduled to perform, Swami had to inaugurate an auditorium and attend a Balvikas programme, but Swami just said, “After tiffin, boys should sing, and tell the veena boy also to play (Swami would sometimes refer to me as Veena boy instead of Sitar boy).” And that day they sang Vathapi Ganapathim and I played for that song. So that's the culmination of the whole story, taking place after nearly eleven years.